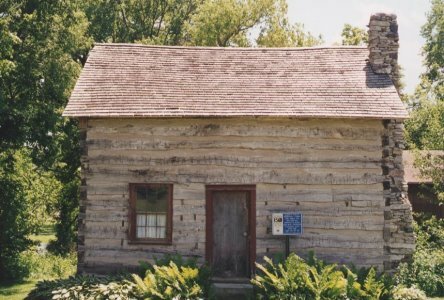 This log house was built in 1858 in Silver Lake Township, northwest of Northwood, by James Randall. His family lived in the house for 16 years before moving to Northwood. The Lars Loken family lived in the house for many years after the Randalls. The house was dismantled and rebuilt on its present site in 1981. It has been restored to its original condition, and a native limestone fireplace has been added. The furnishings are generally from before 1870 and include a spinning wheel, a bentwood cradle, a spool bed, cherry and pine tables, and country chairs, in addition to crockery, wooden utensils, rag rugs, and other items. Location: at the west end of Central Ave (Hwy. 105) at 4th St. (adjacent to the Creamery Museum).